These Terms and Conditions may be changed with the agreement of both the customer and Casey Removals. By confirming a booking with Casey Removals you are agreeing to the following terms and conditions. Where we use the words 'You' or 'Your' it means the customer. 'We, Us or Our' means Casey Removals. You do not accept the quote, in writing, within 28 days with a date in place for the Removal, confirmed by us in writing. Our costs change because of changes in taxation or other costs beyond our control. We have to collect or deliver goods to floors higher than those agreed, in writing, at the time of booking. Additional services, including Moving or Storing extra goods, are supplied by us (these conditions will also apply to these services). Inadequate access preventing free movement of the goods without mechanical equipment or structural alteration, or the approach, road or drive prevents our vehicles to load and/or unload within 20 metres of the doorway, meaning that we have to do extra work. Breakdown of lifts or escalators which were working at the time of quote, meaning extra work. Any parking charges or parking fines that we have to pay in order to carry out services on your behalf (see condition 17). Dismantling or assembling any flat-pack furniture or fittings. We agree in writing to increase our limit of liability as set out in clause 10. In all the above circumstances the price will be adjusted accordingly. Move items from or to a loft (unless well illuminated with safe access). Declare to us valuations of all goods being removed. The value to be used is the current value (not a new for old value). Insure the goods submitted for Removal against all insurable risks where you do not wish to accept 'Inclusive Cover'. Be yourself present or represented throughout the whole Removal. Prepare and stabilise all electric equipment prior to its removal. Empty, defrost completely and clean refrigerators and freezers. We are not responsible for the contents. Provide us with a correspondence address. Other than by reason of our own negligence, we will not be held liable for costs that may arise from any of the above. Non-submission of certain goods for Removal. Items which have potential to damage, explode or be dangerous including gas bottles, aerosols, paints, firearms and ammunition. Food or drink which is refrigerated or frozen. Goods which require government permission or licence for export or import. Payment may be made cash, credit card (with certain exclusions), debit card or cheque backed by a bank guarantee card. In all cases we require cleared funds in our bank account, prior to removal of the goods. Where we have varied these conditions as to payment we may charge daily interest, calculated at 4% per annum above the base rate for Lloyds TSB Bank PLC, with respect to all overdue amounts owed to us. Notice given less than 14 days before the Removal was due to start: 25% of the removal charge. Notice given less than 7 days before the Removal was due to start: 50% of the Removal. If we are liable, we will pay up to a maximum sum of £50 sterling for each item which is lost or damaged due to our negligence or breach of contract. We may repair or replace an item that is damaged. However, if an item is repaired we will not be held liable for depreciation in value. We will not be liable for any loss, damage or failure to produce the goods if caused by fire or explosion unless caused by our negligence or breach of contract. In the event of loss or damage to your goods our liability will be determined by the cost of repair or replacement taking into account the age and condition at the time such loss or damage was incurred. It shall be your responsibility to determine whether the 'Inclusive Cover' provided is sufficient to cover your goods and risks to them. Fire or explosion unless caused by our negligence or breach of contract. 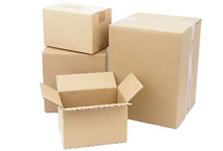 Goods not both packed and unpacked by us, including those in wardrobes, drawers, or appliances, or in a package, bundle, case or other container. To jewellery, watches, trinkets, precious stones or metals, money, deeds, securities, stamps, coins or goods or collections of any similar kind, unless we have confirmed in writing that we accept responsibility and you have given us description and value of those articles. Any goods already proven defective or goods which are inherently defective. 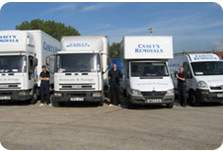 No employee of Casey Removals shall be separately liable to you for any loss, damage, mis-delivery, errors or omissions. Any loss, damage or failure to produce goods which we are delivering must be noted at the time of delivery. Notwithstanding clause 10, we will not be liable for any loss of or damage to the goods unless you notify us in writing as soon as such loss or damage is discovered (or with reasonable diligence ought to have been discovered) and in any event within 7 days of collection or delivery of the goods by us. The time limits referred to in clauses 13 (a) and 13 (b) above shall be essential to the contract. You may make a written request to extend your time for compliance with clause 13 (b). Such a request shall not be unreasonably refused provided it is received within 7 days of collection or delivery of the goods by us. We are not liable for delays in transit other than by reason of our own negligence. 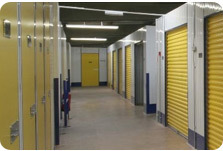 If we are unable to deliver your goods through no fault of our own, we will take them into Storage. At this point the contract will be fulfilled. Any additional service(s), including Storage and Delivery, will be at your further expense. Damage to property other than the goods. For property other than those goods submitted for Removal and / or Storage we will only be liable for damage where it can be proven that we have been negligent. If it is the case that we advise against moving certain goods as it will inevitably cause damage but you give us your express instruction to Move said goods and damage is caused, we shall not accept that we were negligent. For property other than those goods submitted for Removal and / or Storage, where we are responsible for causing damage, you must note this on the worksheet or delivery receipt. This is essential to the contract. 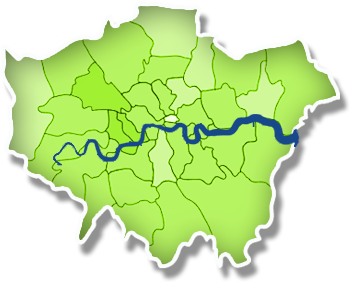 Where we provide Storage Facilities as part of the contract and you do not use us for the Removal of your goods we will make a charge (£75 + VAT per hour (minumum 2 hour charge) to provide access to you, or any agent of yours, for the Removal of all goods. This charge will apply for each visit by you or your agent. Most local boroughs allow 20 minutes loading and unloading time on single and double yellow lines and in residential, pay and display and loading bays. If your Removal Time is expected to be twenty minutes or less and these parking conditions apply directly outside the Removal location then you need not make any provisions for parking, however this is done at your own risk (see condition 17 (c)). If your Removal Time is expected to be more than twenty minutes, provisions for the parking of all Removal Vehicles needed to undertake your Removal in a position directly accessible to the removal location and for the duration of the Removal must be made prior to the Removal date at your own expense. In the event that provisions have not been made extra charges may be incurred (see condition 1(h)). If a Penalty Charge Notice (parking ticket) is given under the circumstances in conditions 17 (a) or (b) we will endeavour to the best of our ability to appeal against the issuing of the ticket. However, if an appeal is not upheld, payment of the Penalty Charge Notice will be your responsibility. Unless it has been specifically agreed in writing on our quotation, customers may share space with other consignments on our vehicles.